There are few sea creatures inhabiting the waters of the UK that don’t take too kindly to being disturbed by divers. Here we highlight some of the most common to watch out for. Although very few of the multitude of creatures inhabiting the waters around the British Isles are harmful to divers, there are a few that can cause upset if come into contact with. It is therefore useful to know which species to keep an eye out for and how to respond if one does turn nasty. Public notices warning of weeverfish are a common sight on beaches around the UK. This is because, in being difficult to spot and causing a very unpleasant sting for those who get too close, they are a particular hazard for bathers. Like beach dwellers themselves, the weeverfish also favours sandy, warm, shallow waters. However, the fish likes the environment because it offers an ideal place in which to hide, and lie in wait for unsuspecting smaller fish to feed on. The sand allows the fish to conceal itself and, as a sandy coloured creature, the golden grains offer good camouflage. The weeverfish can be up to 10cm long and to protect itself it has around 5 to 7 poisonous spines protruding from its dorsal fin. It is not only its prey that has to keep an eye for the weeverfish. Its spines can cause a great deal of agony amongst bathers, divers and other sea users if they unknowingly tread on one of these hidden creatures. Initially you feel a sharp pain, and then this feeling is followed by an intense stinging pain. The wound might be difficult to recognise at first, but careful inspection reveals pin pricks about 1cm apart with minor reddening around them. The best immediate treatment is to soak the wound in very hot water to try to remove the toxicity of the venom. It is then advisable to seek medical attention. 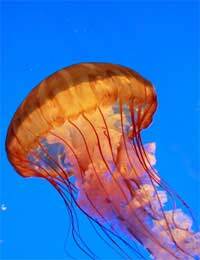 Another common, and hazardous, feature of UK sea shores is the jellyfish. Fortunately these colourful, free swimming creatures are usually easier to spot and avoid. They typically appear in swarms and also follow seasonal breeding cycles and so the risk of coming into contact with them can be reduced by respecting local proliferation. Although most jellyfish are prone to stinging people who get to close, very few are a serious hazard, with most stings fairly innocuous. An ice pack would generally be effective treatment. The one jellyfish that strikes worry into the hearts of divers across the UK is the lion’s mane. Although the sting of this giant of the jelly world (they can measure up to 2m in diameter) can be innocuous, when it hurts, it really hurts. It can produce blisters, irritation and muscular cramp. The lion’s mane is commonly found in the colder waters off the west coast of Scotland and in the northern North Sea. Another source of diver concern is the stingray. These are commonly found in shallow waters and are particularly active during their summer breeding season. Although not naturally aggressive creatures, they will take action if somebody is seen to threaten them in any way, such as by stepping on them. Their response is typically a vicious lash of the tail. Attached to the base of the tail is a serrated spine that will penetrate the skin of the attacker – usually in the foot or the calf – leaving a toxic spine, which will cause a great deal of pain. The wound should be soaked in very hot water for 15 minutes at a time. If the spine is embedded and cannot be easily removed then medical attention should be sought. If you look after the wound yourself, then ensure it is thoroughly cleaned with soap and water and that a general antibiotic cream is applied once the wound is dried. Another common venomous fish is the scorpion fish, which also use their defensive spines to inject toxins into anyone that poses a threat. They are difficult creatures to spot as they are camouflaged and tend to hide out amongst rocks in bays, along coastlines and coral reefs. Divers typically encounter these fish by accidentally touching or kneeling on them. The power of the sting depends entirely on the species of scorpion fish. The most fearsome are found in tropical seas, and include the stone fish, which can even kill a human with its venom. However, those found in the English Channel – where they inhabit more than anywhere else in the British Isles – give a painful although relatively mild sting. Wounds should be treated in the same way as those from stingrays – very hot water, followed by application of antiseptic cream.